McClatchy Studios, the documentary production arm of newspaper publisher McClatchy, is bringing back its documentary series “Titletown, TX,” but for its third season will incorporate a virtual reality component. 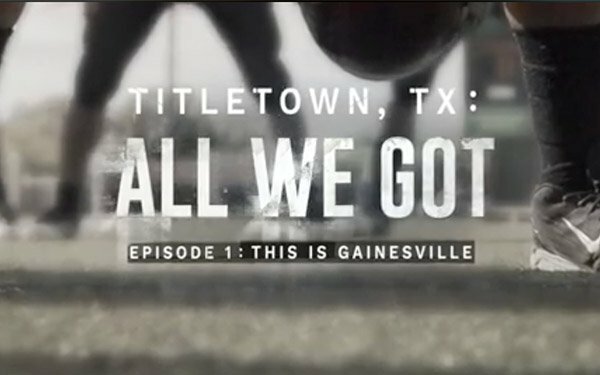 Called “All We Got,” the 13-episode season focuses on the football program at Gainesville State School, a state-run, juvenile detention facility in Texas. The series follows a group of incarcerated teenagers at the facility, and looks at their troubled pasts and the challenges its first-year head coach faces as he builds a competitive football team with the hopes of guiding the mostly young black teens away from lives of crime. "'All We Got' adds another unique chapter to our series about football and the culture surrounding it in Texas," stated Jonathan Forsythe, director of editorial video at McClatchy. "Our producers gained exclusive access to the facility to tell the personal stories of teens who were trying to redeem their lives through football, and the dedicated Texas Juvenile Justice Department staff motivated to help them." The first episode is available now on Facebook Watch, The Fort Worth Star-Telegram website (a McClatchy property), and YouTube. New episodes of “All We Got” will post every Wednesday. The first season will also be available on Amazon's Prime Video Direct platform. The McClatchy Studios and McClatchy New Ventures Lab also produced a special virtual reality experience this season. It follows a day in the life of one kid at Gainesville and another kid from a private high school as they each prepare for the football game that evening. The episode follows the two high school kids from the moment they wake up to when they play on the field, with a 360° split-screen environment. Viewers can pan to the left to watch the Gainesville teen, and to the right for the other student. The experience features stereoscopic 360° video and spatial audio. It is available for virtual reality headsets on YouTubeVR, and soon will be posted on the "Titletown, TX" Facebook Watch page. Peterson said the split-screen takes viewers into the life of an incarcerated youth and a high school football player in the "free world," and their coming together on a football field. “We wanted to place the audience inside their routines, showing the stark contrasts, and surprising similarities, these players face,” she said. Koscielniak added: “Once you're in the [VR] headset, there's no escaping the difference between each player's experience."